Laila Levenson has always been the baby of the family, but now with her older siblings, Mira and Krish, leaving home just as she starts secondary school, everything feels like it's changing... can the reappearance of Nana Josie's Protest Book and the spirit it releases in Laila, her friends and her local community, help her find her own voice and discover what she truly believes in?A powerful chime rings through Laila's mind, guiding her to walk the footsteps of the past on her way to discover her own future. Sita Brahmachari, for me, is one of those authors where I've been meaning to pick up one her books forever, and it's just never happened. So when Tender Earth popped into my inbox, I decided that this was it. I was finally going to read a Brahmachari book - and I can honestly say I'm so glad I did. I went into this book having just finished a fairly heavy-going high-ish fantasy and this was the perfect antidote to that. Strong, powerful, emotional and moving, this book was grounded in the real world and is the ideal contemporary to move onto. It managed to be an impactful and emotional novel, whilst still staying light and not becoming too heavy. First, before we even talk about the premise and plot, can we just talk about how freaking gorgeous the writing was in this. It was an absolute pleasure to read, and exactly what a novel like this one needs. Brahmachari is so masterful in the way she uses words, the perfect amount of whimsy and tenderness to build the world and story beautifully, whilst both conveying and evoking emotions in the most stunning way. The lucidness and smoothness of the writing just allows the story flow gently, passing through you, investing you in the novel. I think what really struck me about the writing, though, was the way it managed to make me feel - with a novel like Tender Earth, I think a massive part of the story working well, is the writing being able to evoke the correct emotion from the reader, and do that well. Brahmachari does this beautifully, in such a way that you just have to keep reading, and in a way that really allows you to empathise with the characters. As for the story, it left me speechless. Very few books give me a book hangover, but this one did - for a full 24 hours after finishing Tender Earth, I could not pick up another book, nor could I stop thinking about this one. It follows Laila, as her world seemingly falls apart, the journey leading her to this whole new self-discovery and world-discovery. We follow her as she learns about and experiences the real world, and watch as how these experiences begin to define her and a make a 'new' Laila. It's almost kind of a coming of age story, and it was a journey that I loved following. I think there were two things that really stood out for me. The first was that these books explore an age in everyone's life that generally isn't spoken about much, and explores it in a very unique and real way. Like I just said, it's kind of a coming of age story, in the sense that we actually have two. Yes we have that point when we enter adulthood and experience the world of work and bills, but as children we also have this coming of age when we move from primary to secondary school, when our friends and worlds are changing, when we begin to grow up and experience new emotions, both our minds and bodies changing. Brahmachari manages to explore this so beautifully, in a way that I think a lot of people will connect with. The second thing that stood out about this story is its relevance. It touches upon some really important issues that surround us today, such as refugees, animal cruelty, having a voice and exercising this voice. Again, Brahmachari does this artfully, not shoving in your face, but instead gently weaving into the story as a part of Laila's life, as is the case with so many children nowadays. With the internet and an information / connected society, the step from childhood to teenagehood has changed massively, and Brahmachari does a stunning job of exploring this, and the effects it can have on those children. The characters in this were perfection, also. Laila is an instantly loveable character who you couldn't help but care for in the most parental way. You felt everything she felt and just wanted her to be happy, and for everything to work out. Again, this falls back onto Brahmachari's writing, which allowed me to connect with Laila so well, and really feel as if I knew her. The way Laila was crafted, from the ground up, and with so much depth, meant that we really got to know her and in turn made her an incredibly evocative character. What was brilliant, though, was that we got to see Laila grow and become this new person. Brahmachari did this expertly, allowing us to really understand Laila and her emotions, as she transitioned through this point in her life, the whole book moving from an almost melancholic tone to a much happier and spirited one. I think with a book like this, so much depends on the character, and Brahmachari absolutely nailed it with Laila, and all the people Brahmachari chose to have surround her. The characterisation was expertly done here. Overall, Brahmachari has crafted a wonderful and whimsy coming of age tale, that will make you feel so many things, but ultimately leave with a warm fuzzy feeling. 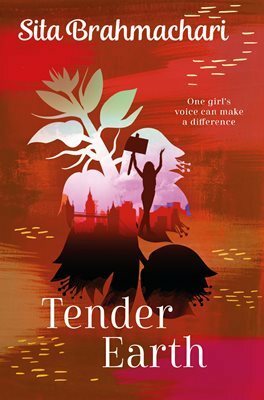 If you need a light, yet evocative novel, Tender Earth is definitely one to check out. I am so glad I finally managed to pick up one of Brahmachari's novels, and will most deftineily be going back to read her previous ones. This really is a book to treasure.